NASA… oh well, obviously they are not the same Scientists that put man on the moon. From the great Saturn-Five, then scaling back to the Space Shuttle and now it’s down to Robots… The current move appears to be in Cyber Space ; where reality, is a lost priority..! NASA has the noble task of Muslim Outreach. And they only studied the land surface greening. Calcifying marine organisms will generally find it harder to make and maintain their carbonate skeletons as increasing concentrations of atmospheric CO2 acidify the oceans. Nevertheless, some types of organisms will be damaged more than others, and some may even benefit from higher CO2 levels. Coccolithophores are a case in point, because their photosynthetic ability is strongly carbon-limited. Rivero-Calle et al. show that the abundance of coccolithophores in the North Atlantic has increased by up to 20% or more in the past 50 years (see the Perspective by Vogt). Thus, this major phytoplankton functional group may be able to adapt to a future with higher CO2 concentrations. Well that is a load of BS. ! What could have been a good paper tainted by the “acidification” farce. They should have reported just what they found instead of delving into science fiction. Of course phytoplankton are becoming more functional. Every life type does, when properly fed. things like this are embarrassing for my field…. Well, climate science papers must use proper climate science terminology and social context. Slightly neutralizing alkaline sea water is “acidifying”. The corrosive basic “acid” will dissolve sea creatures, the oceans will boil and we will all die. Slightly warming the Arctic from -25C to -20C is “overheating”. The “hot” ice will melt, the oceans will boil and we will all die. That is science so stop denying it. Will the Climate Hustle movie, May 2, 2016, change anything? Not much because people are not interested in the facts when they are deep into an alarmist religion. In the absence of satellite data the open ocean does not get measured at all does it? Wrong and you know it. ARGO has done temp and salinity since 2003. Tide gauges have measured SLR for centuries. There are pH measurements for barren station Aloha north of Oahu going back ~30 years. Up your game or do not play. So I’ve been coming to this site and reading the blogs and the comments for a long time and people who I don’t understand at all are ones like cdqgfj and others who come on here and argue that these are the blogs that are fraudulent or the graphs on here are cherry picked and wrong. I don’t understand their way of thinking or why they argue every step of the way at the possibility that NASA and the NOAA and are lying to us to make money, using propaganda to make us go green. Why can’t you accept that? : Wouldn’t you prefer that be the truth? Or do you want climate change to be a dangerous threat to humanity? Do you want everything the alarmists are saying to be true? Why? Wouldn’t you rather prefer that everything isn’t as bad as our government is claiming it to be? Plus why would Steven be lying about everything he posts? What would he be gaining from that? Is he getting paid by big companies to say everything he does? Not likely. Think about it, why would there be so many skeptics, so many people who agree it’s all a scam and can provide evidence that the warmists are lying if it wasn’t true? Do you think they get some kind of kick out of it and are just waiting for climate change to kill us all? NO! You really have to open your eyes and look at the facts. Not one claim, not a single claim made by a climate alarmist has come true, the year comes, the year passes, we’re still here, the ice is still here. Do you have any idea the ice that’s being talked about? Huge monstrous amounts of ice that would take years and years and years to melt and flood the planet. Longer than any of us would be alive. Don’t you think if this was a true serious threat that we would immediately taking all the precaution that we can? Don’t you think if this was indeed a 100% true proven science that everyone would be on board and there wouldn’t be a single person saying it’s all a hoax and there’s nothing to worry about? Wake up! Human beings are here for a far more important reason than to just exist for a short amount of time and then become extinct. We’re just a blip on the radar compared to how long the planet has been around and it has been through far far much worse than anything we could even possibly do. It’s all evolution. Stop listening to the sky is falling and think for yourselves, take a look around, this planet is still beautiful in plenty of places, still plenty of good hard working happy people, the sun rises and sets, the world keeps turning, and we’re still here and will continue to be here. Stay out of the media, get away from the fear mongering and think for yourselves. Accept the fact that the people here just want to help others understand that even though this world and this life can be scary, get you down, seem terrible, there’s always a light at the end of the tunnel, and if you find the strength within yourself, things aren’t always as bad as they seem. Hey BobbyK! Bravo! Great rant — and one that the alarmists ought to take to heart. Like you, I cannot understand the CAGW enthusiasts (and I use that term “enthusiasts” specifically). They really do seem to take a certain delight in the idea that the planet is dying. Even when sceptics use NASA’s own charts to show that the climate catastrophe is bunk, they refuse to look at it rationally. After years of talking to alarmists (yes, some of my best friends are alarmists! ), my best theory about their behavior is the following. I believe that many alarmists have some deep emotional issue that is being covered up. It may be a perfectly valid problem, not at all imaginary, but one that is too difficult or disturbing to face head on. For instance they may be caring for an elderly or dying parent, they may be long term unemployed, or stuck in a bad marriage, or having deep financial problems. Catastrophic Anthropogenic Global Warming gives them a much more acceptable reason for feeling so bad. The planet is being destroyed. The biosphere is dying. The ice caps are melting. Super storms are flooding our cities. Etc, etc, etc. I am sure that you have noticed that talking with alarmists, how they often respond angrily (sometime VERY angrily!) at any suggestion that CAGW may not be quite so catastrophic as they think. Some alarmists are so vehement that they will curse, will shout, and will show all the signs of preparing for physical combat (such as clinched fists and jaw). When you challenge CAGW you are challenging the prop they use to cope with an emotional crisis which they cannot otherwise face. Catastrophism (like most drugs) requires a larger and larger dose as time goes by. The only hope I see for many alarmists is that eventually the distraction which CAGW offers from their personal problems will become less and less and they will quietly drop the subject and find some other mechanism to deal with their inner demons. I just hope that the CAGW support dies out before we are all driven into bankruptcy and poverty. BoobyK. What you are illuminating, I feel is the sad overall disconnect which is increasing at an alarming rate in our country and our planet. The whole AGW then ACC then CAGW or make that CACC is in fact a micro study of human nature, and one that is not unique or historically unusual. It has become a religion and one in which its followers will not ever consider facts as presented to them. It is sad that an entire segment of the science community has jettisoned the basic structure/format to which it states it adheres . I follow several blogs, sort of a counter culture to the MSM. What I feel is unique to this blog is that what is presented is often simply historical facts/data/comments which are undeniable. The presentations are often mirror images of what the alarmist community has itself presented. Then again, just like in our current state of politics, it appears, often, that facts do no matter. Gavin Schmidt’s NASA adjusting climate data to fit its government (taxpayer) funded, Mann-made global warming narrative ~ ‘shock news’. Interesting original article from Hansen et al 1983, relating melting to an increase in the earth’s moment of inertia, thus slowing rotation. The AGW community always chooses shorter time periods and fails to look at long term changes due to lengthy forcings. Would anyone here doubt climate change? Of course not! But it is a mega leap to attribute that change to an increase of a trace gas. Related to this is the assumption that the only two causes of sea level rise are land ice melt and thermal expansion. Melt is easily quantifiable. Ocean temp and related heat content, not so easy. 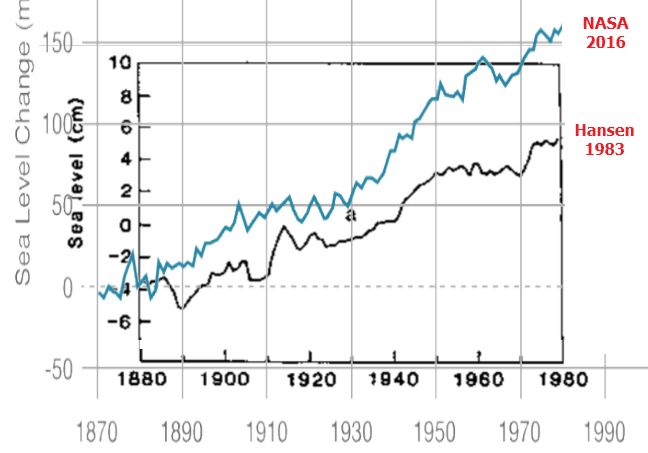 But figures are manipulated by adjusting sea level rise, the result of supposedly two and only two factors. The thought is to subtract rise from melt and one should get rise caused by thermal expansion. However, that does not always work on balance. I am looking for a study that I read which suggests that 42% + or – of rise may be due to sub surface water run off. IMO that is a huge environmental problem which is almost totally overlooked. Aquifers are being significantly depleted at an accelerating rate. Cut them some slack, Bobby. The are busy making fools of themselves.